We believe we are Perth’s No 1 Car Wrap and Car Wrapping Specialist and we don’t make this claim lightly. Our team of car wrap and vehicle wrapping experts at Signarama Joondalup and Osborne Park have more than 18 years’ experience. We have developed custom business systems and use industry specific equipment to enable us to provide car wrapping services of the highest workmanship and quality. Our multiple industry awards are a testament to our quality and professional service. For your car wraps and vehicle wraps we only used quality 3M vinyls and a protective UV film is also applied to prolong the life of your vinyl wrap. Our applicators are all 3M trained and certified and are recognised by 3M as “3M preferred graphic applicators. We can provide a full range of different car and vehicle wrapping options for your vehicle, from car magnets, one-way car window signage to full and half wraps or simple spot graphics. Our full range of car wrap options can also be supplied for your work vans, trucks and utes. You can view our comprehensive car wrap pricing schedule and download our vehicle & car wrap guide, including pricing, as a pdf here. A full car wrap covers all paintwork with digitally printed vinyl graphics, excluding the roof. We can do a full vinyl wrap on most vehicles, including cars, vans, utes, buses and some trucks. Also, within this category is a full colour change, where we use 3M solid colour vinyl to wrap the entire car. Most clients choose to proceed with a closed door colour wrap, opposed to an open door wrap, which requires all doors to be removed from the vehicle and door jams wrapped. A full colour change can be used on its own or with complimentary advertising graphics. This second layer is applied to the surface of the coloured vinyl, using digital printed die cut graphics or cad cut vinyl graphics. To get the best finish for your full car wrap we remove the badges on your car and wrap over this area to provide a professional finish. The badges are placed in your vehicle glove box, for re-use at the later date when the time comes to reselling the vehicle. A partial car wrap covers part of the paintwork and generally excludes the bonnet. The two most common methods in this category is wrapping partial panels along with minor spot graphics or having ½ the surface area covered with spot graphics. The vinyl decals can be manufactured through digitally printed die cut graphics or cad cut solid vinyl graphics. Although it is most common to see a partial wrap done for a car, we can also do partial wraps for buses, caravans and some trucks. This option is predominantly used for contour cut vinyl graphics, that only cover minor areas of the vehicle panels. For someone only wanting to have their logo and contact numbers present on their vehicle, this is a budget friendly option. Other Car Signage options can include car or vehicle magnets, one-way car window signage and mounted 3D signs. One of the most critical elements for your car wrap is coming up with a visually effective and striking car graphics design. One that makes you feel proud every time you look at your car and gets customers calling your business. A poor design, irrespective of the quality of the car vinyls used, will not catch your customers attention, conveys the wrong message about your business or can make it difficult for customers to contact you. At Signarama Joondalup and Osborne Park we have an in-house Car Wrapping Design Team, who are specialists in this field. As a vehicle is a 3-dimensional object that is curved, your design can become quite complex. That is why it is essential that your design is completed by a specialist Car Graphic Designer, who can navigate you through the process. Our team are highly trained and have many years’ experience in this area. Their expertise is supported by a database of design templates for a large range of different car and vehicle makes & models. The process starts with one of our Car Wrap Sales Reps booking in a time to come and check your vehicle and discuss your initial design ideas. Our rep will also have extensive car wrapping knowledge, so they will be able to advise and recommend different options that would best suit your budget and requirements. During this meeting we will photograph and measure your vehicle and also check for factors that can affect the design. These factors include the positioning of windows, the condition of the current paint work, if there are existing graphics that need to be removed, the presence of pop rivets or screws, etc. After this meeting, a comprehensive quote will be supplied to you. Upon acceptance of your car wrap quote and payment of the required deposit, we will proceed to the design stage. Our Graphic Design Team gather all the required elements such as logos, colours, photos, etc and then design some concepts for you to approve. The concepts are superimposed to the photos of your vehicle to size and scale. This helps to make the approval process much easier for you. As our Car Graphic Design Team are all based in Perth, it is very easy and convenient for our clients to come and discuss their requirements ‘face to face’ with one of our car wrap designers. We have divided the frequently asked questions into 2 categories. Firstly, those questions commonly asked when customers are investigating car and vehicle wrap options, but have not yet proceeded with an order.The second category for customers who have decided to proceed with an order. You can find a full summary of the car wraps prices and vehicle wrapping prices here. I’m not sure I can afford the car wrap I had in mind. What are my options? We offer a product exclusive to us called ‘Signs on Finance’, which enables you to start promoting and growing your business today through effective vehicle signage, while enjoying the convenience of monthly payments spread over 4 years. Alternatively let our car wrap Sales experts discuss other options, which may better suit your budget but still deliver an effective result. Will the vinyl wrap damage my vehicle’s paint work? Absolutely not. In fact, they will do an excellent job of protecting your vehicle’s paint work from UV rays, associated fading and minor scratches. This will assist in achieving a good resale value. If the car wrap is not a full one, then those areas that are not covered with graphics may fade a bit. This is a result of those areas not having the inbuilt UV protection that is afforded by having vinyl on the vehicle. Can I get my car wrap off when I want to sell it? Interesting question. This is where the use of high-quality vinyls will pay off. Poor quality, cheap vinyls will be very hard to remove. There is every likelihood that they will break apart and have to be taken off very slowly in small pieces (about the size of a 20 cent piece). Cheap vinyls will also leave adhesive glue behind that will be very hard to clean off. In contrast, the correct 3M vehicle grade vinyl will be easily removed with through the use of heat from a heat gun or hair dryer. This is what the good films are designed to do – be easily removable without damage to the paint work and leaving residue. How long will my Car Wrap Last? Vertical application of vinyl (Note horizontal application are not warranted, but sometimes your design might necessitate this). Can I just get you to print the vinyl wrap and apply them myself? We sure can do that, but highly recommend against doing so. Our Applicators are all trained to an advanced level, this is how we achieved our 3M platinum preferred graphic applicator accreditation and we have many years of car wrapping experience. As our vehicle vinyls are backed by a 3M MCS (Matched Component System) warranty, you can be confident you will get professional car wrap, applied by professional applicators. Our experience has been that when we supply graphics, and the client undertakes the install, we often end up re-printing them and applying them ourselves, at the customer’s expense. Our Company has a Vehicle Fleet can you help us manage of signage requirements? An essential part of good company branding is the effective design, application and management of the signage for your vehicle fleet. At Signarama Joondalup / Osborne Park we have extensive experience helping companies, franchises and business with multiple stores manage their vehicle fleet signage requirements. 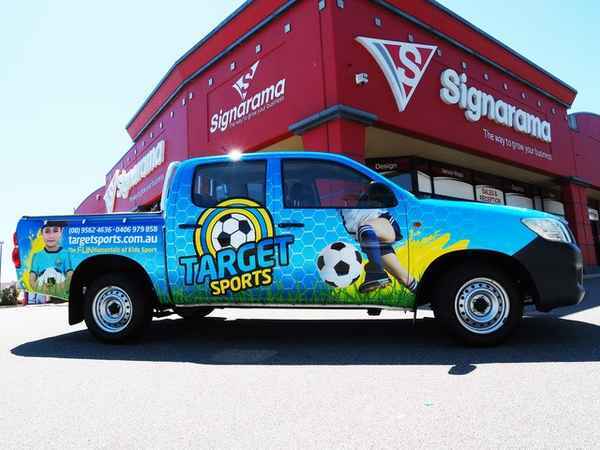 We can co-ordinate your vehicle signage requirements through more than 100 Signarama stores throughout WA and Australia. This will ensure consistent branding is maintained and to simplify managing each of your locations / store’s requirements. What happens to the badges on my car? The worst result for wrapping a car is for a signage company to leave the badges on the vehicle, and to cut around the badges. That provides a weak point for the integrity of your car wrap and doesn’t look professional. At Signarama, we will remove the badges and wrap over that area. We will then place the badges in to your glove box, so that when time comes to unwrap and trade the vehicle in, the badges can be re-installed. How long does my car wrap take? The first priority is to get your design concept right. We normally return your initial design concept within 3 days of receiving your order. Once that is approved, our Vehicle Graphics Manager will phone you to book a mutually convenient time to have your new graphics applied. This will normally be done within 10 working days after the artwork approval. How long do you need my car for? This varies a lot, dependent on the coverage involved in your design. One way vision to a back window can be done in 90 minutes, whereas a full wrap of a van can take 1.5 days. What should I do prior to bringing my car in? If there are existing graphics on the vehicle, and you are not paying us to remove them, then the graphics and all adhesive residue must be fully removed. The day before the car wrap is scheduled, your vehicle should be washed and cleaned, but NEVER waxed. Unless you are waiting in our fully serviced Board Room, then arrangements will need to be made for you to be picked up.